The trumpet player Julián Sánchez is at present one of the most highly recognized musicians in the Spanish jazz scene and with increasing international presence, whom has performed on stages such as the San Sebastián and the North Se Jazz Festivals. His Andalusian roots and his interest in folklore have led him to participate in jazz flamenco projects of highly relevant figures such as Chano Domínguez, Miguel Poveda, Jorge Pardo and Perico Sambeat. His interpretation of flamenco and “conducted” improvisation in his project “Antes fue el grito” with the Free Art Ensemble, his projects with the pianist Agustí Fernández or his formation Sindicato Ornette are testimonies of his avant-garde works. 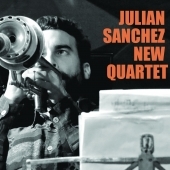 The formation New Quartet he presents is based on his own original repertoire. Musical ideas that stem from small melodic motifs and grow into a collective discussion, in between solos and silences that let the trio breathe. All this gives off an aura of intensity and orchestral amplitude. If the trumpet is the axis of the group, the piano trio is the solid platform for the quartet’s music. The pianist Marco Marco Mezquida, the double-bass player Bori Albero and drummer Ivo Sans are a high credential of great creativity and energy.